Do you know how high audience expectation is of the loading speed of a typical webpage? With passing years and staggering improvements to web-based technology, the average browser is accustomed to speedily loading pages and apps. If your website is lagging even a second behind the ideal loading time, you risk losing the interest of your potential customers, so carrying out a website speed test is very important. 79 percent of shoppers who are dissatisfied with a site are less likely to return to the site again. Heck, even Google seems to like page load time so much that they have added it as one of their many ranking signals. Back in 2010, they made an announcement that your site speed would affect your search rankings and its importance grows with the time. So, if you regard usability and SEO highly for your website's online success, you must pay attention to your website's page load time. Today, I am going to list out useful page load time measurement apps that will help you detect the loading times of your website. One of our popular blog posts from the past lists 20 Quick Tips To Optimize Page Load Time. You can test your site's speed using these apps and then apply these tips to your site for an optimized web performance of your site's pages. Even better, all these website speed test tools are FREE. You get step by step information of the time taken to start to render the loading of your webpage till the time it is fully loaded. You can even view the screenshots of loading stages on your website, under the option screenshot in the main menu. 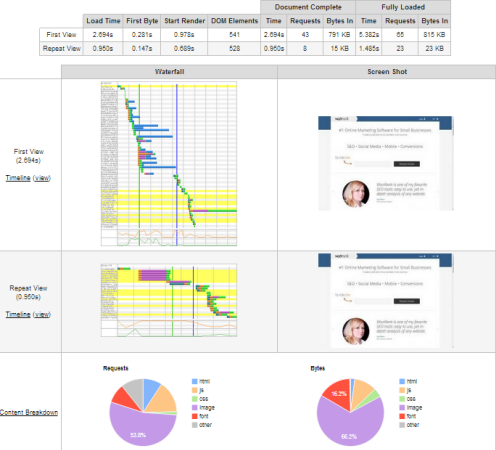 You get a waterfall chart of the content breakdown of your website load. These different content elements are represented by different colors. They are html, js, css, image, flash, font and others. You also get a complete optimization checklist, under the _Performance Review_menu along with some more tips to optimize your page speed. Google's PageSpeed Insights tool offers page speed analysis of both desktop and mobile versions of your site. You get a page speed score out of 100. If there are elements on your page that you need to consider fixing in order to optimize your site's speed, the website speed test lists all those, along with a link that shows you how to fix them. 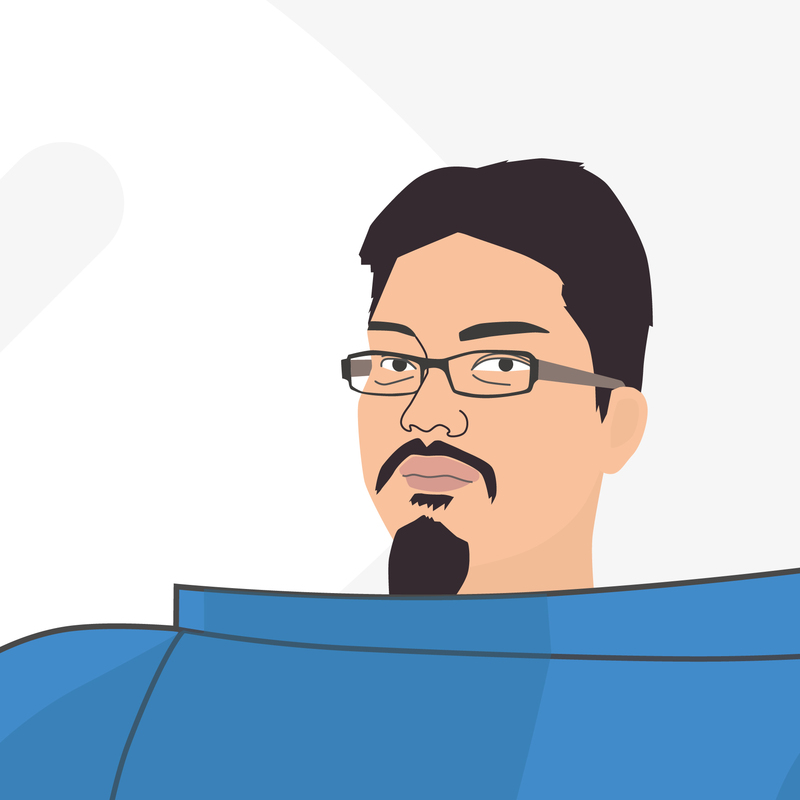 The report also tells you what you have done right on your website that helps optimize its loading time. It gives you a score for your site's loading time on a mobile as well as for the user experience. The mobile page loading time score is followed by useful tips that will help improve your mobile site's loading time. You can also install Chrome and Firefox extensions to your browser. You can avail (an invite-only) page speed service from Google. Click here to access the form to receive an invitation. This is an add-on app for browsers. 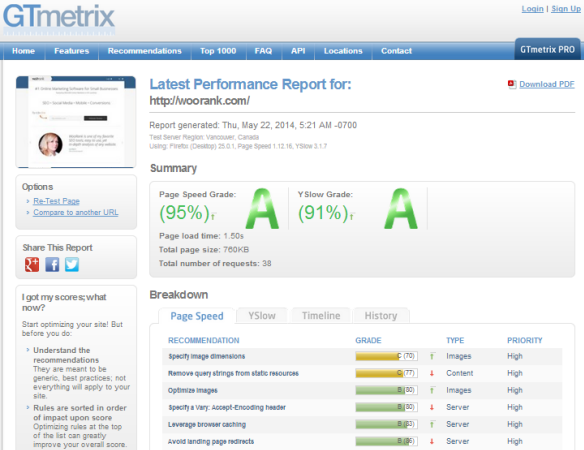 It grades websites out of 100 based on overall performance from the three predefined rules set. 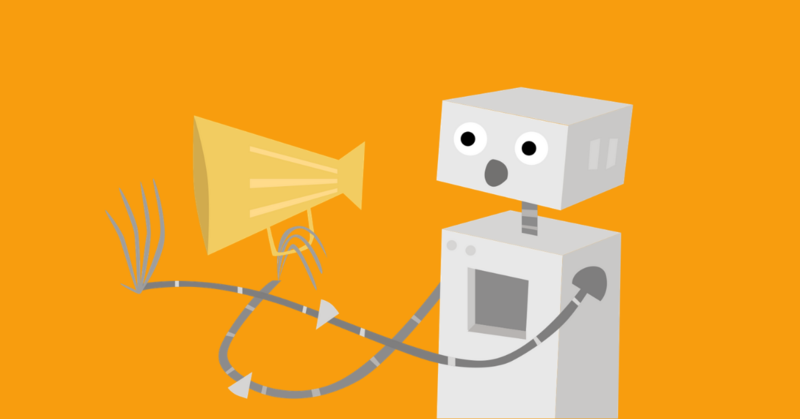 Offers tips for optimizing page loading times. Provides tools to optimize web page performance, wherever applicable. It gives your webpage a GTMetrix page speed grade along with a Yslow grade. You can download a PDF version of the report. It gives you website performance grade (out of 100), number of requests, load time, page size and out of what percentage of tested websites is your website faster. 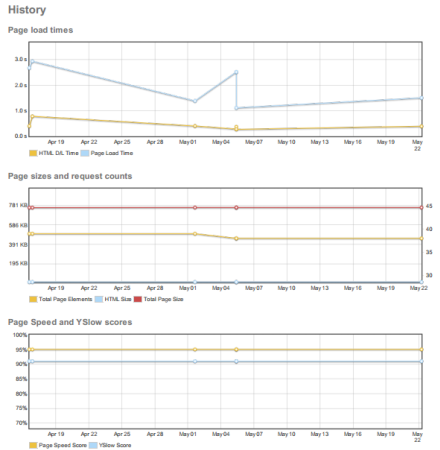 See how your website scores against various performance parameters from Google Page Speed and Yahoo's Yslow, under the _Performance Grade_tab. 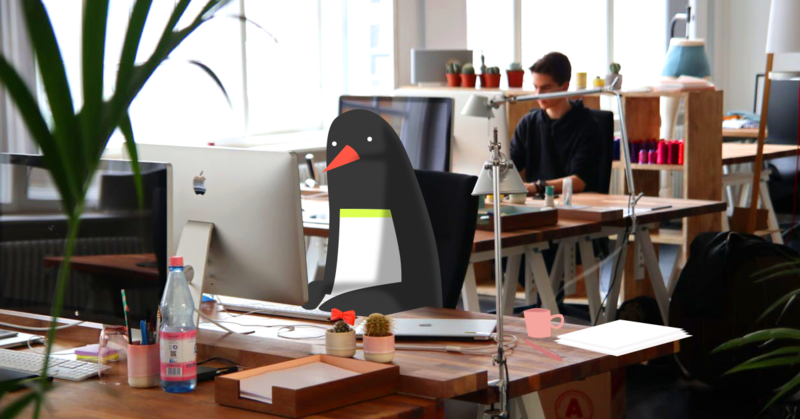 You can track your performance history, test from multiple locations and share your results. Get page size, composition and download time of your website. It sums up a list of page components with relevant comments against each. 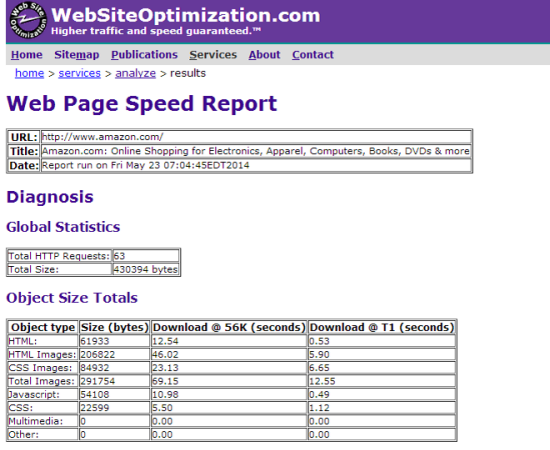 The report also gives recommendations for your site to optimize your site's speed. Get an extensive page load analysis that includes page size, load time, download speed and average speed. 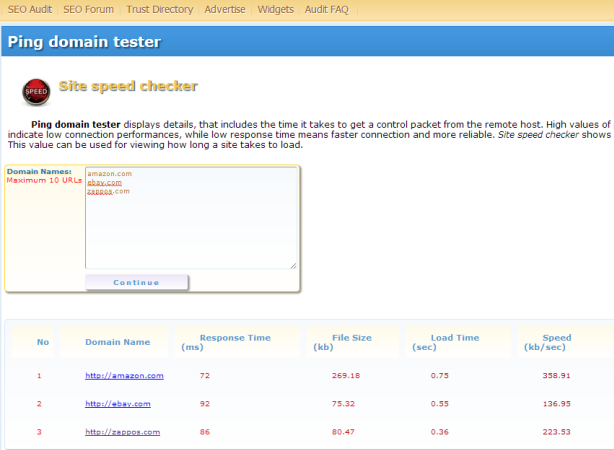 The tool gives you estimated load time of your site for various connection speed. 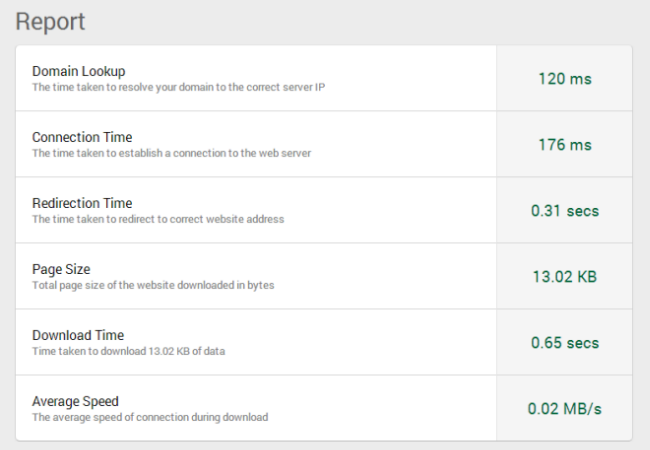 It is a pretty simple tool that gives data time taken to resolve your domain to connect to server IP, time taken to connect to web server, redirection time, page size, download time and average speed of connection during download. It also shows you sectioned view of how long different files on your website take to load. The tool is pretty basic and it gives lesser information compared to the tools listed above. 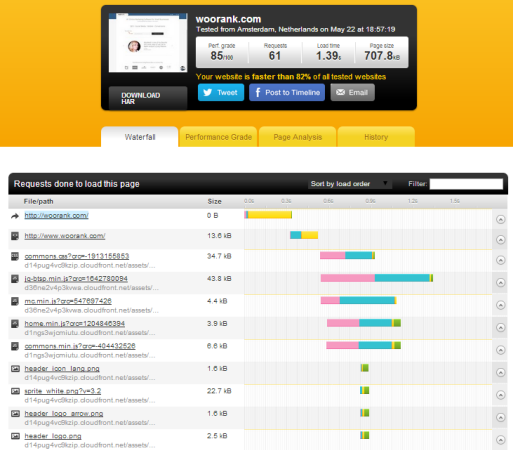 It is similar to the above tool that lets you compare your site speed with competitor sites. The only difference is you can run a comparison for site speed of ten sites simultaneously. It gives you comparative information about response time, file size, load time and loading speed (kb/s). So, these time measuring tools are available to you for free on the web. You can choose any one of them and have a constant check and diagnosis of your website's performance in terms of loading speed. It is important to check your site speed on a regular basis. Your site may load faster on your web browser due to cached content but it may not load that fast on your customer's browsers. Hence, website loading time testing tool can be a real eye-opener as to what your site's real loading time is. Most of these tools give tips that are technical. 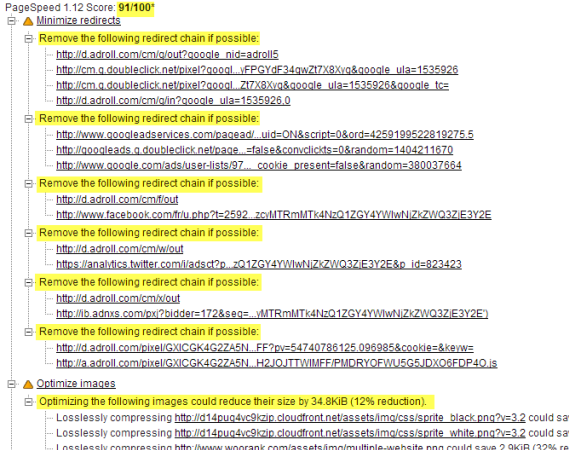 So it is best if you have your website developer with you when running these tests on your site. Since, the changes made to optimize a site's loading time requires a lot of work it is not feasible to have the test done on your site every now and then. You can keep an interval of four to six months between each test. 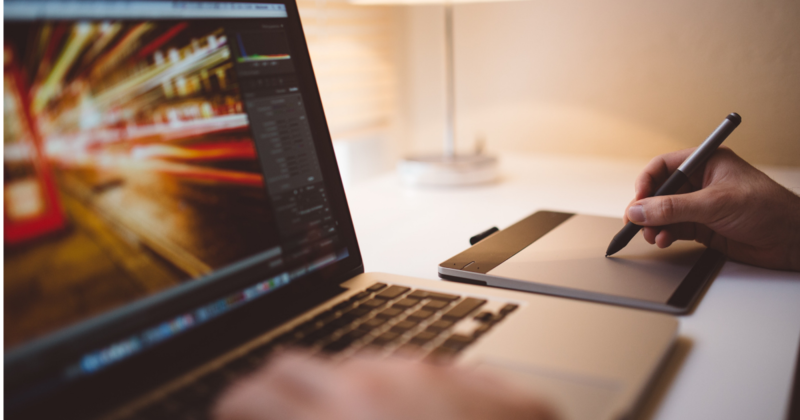 In cases, where you add new images or plugins to your site, you must check your site speed using these tools, after changes have been implemented to your site.